The Spotlight-TC Set, Guitar pickups kit from Swineshead Pickups. Swineshead Pickups Has Released A New Range Of Tele® Pickups. The Spotlight-TC combines a tight low end with clean highs providing a classic sounding Tele® pickup. The bridge version comes with a traditional ferrous metal baseplate to help the guitar cut through the mix of a full band sound. The Dragonfly-TC is designed for players who need more low end power and less of the piercing high end which can typify many Tele® pickups. The Dragonfly-TC bridge model doesn't use a metal baseplate instead using a thick plastic bottom to fatten up the overall tone. Like all other Swineshead pickups the new Tele® pickups are available in a wide range of colours, woods and finishes. 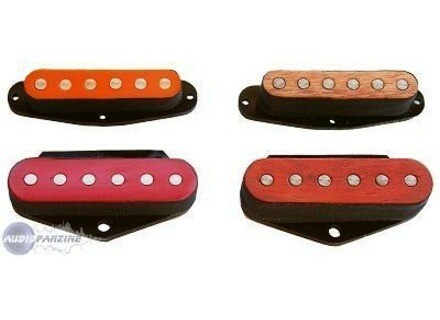 Plastic Tele® pickups are £42.95 each whilst the wooden Tele® pickups are £52.95 each. Postage is free worldwide on orders over £70. DigiTech HarmonyMan Digitech® Introduces Harmonyman™ Intelligent Pitch Shifter Guitar Pedal. G&L Classic Bluesboy Spalted Maple Top G&L Presents ASAT Classic Bluesboy With Spalted Maple Top. Empress Effects Super Delay Empress announces that their new Empress Superdelay will be available May 12, 2008.